If you've been playing Game of Thrones long enough, you've either seen or heard of the infamous Sand Snake rush. The concept is fairly simple: get out the Red Viper, kill him or let him die, then play No Use For Grief (DB), kneel three influence, and vomit Sand Snakes all over the board. Ever opened one of those stupid cans of Peanut Brittle, so sure you're going to have a delicious treat, only to have spring-loaded snakes explode into your face? It's like that but instead of snakes it's a bunch of pissed-off women. When building the deck correctly, you're basically triggering an effect that can allow you to immediately place up to 10 different characters on the board immediately. And since they're Sand Snakes, each of their abilities benefits the other. This is not to say that there aren't vulnerabilities, because they are many. First, you need to even get the Red Viper out. Second, you need to have at least three influence to use. To the Spears! (PotS) and didn't kneel anyone. I've played this deck several times and it's always been a blast. Honestly, half the fun is playing against someone who is unaware of what's about to happen and then watching their face as you load up the board with cards. Lots of bluffing and acting are helpful too. One of the key things I've found is that you need to not only bring in all the Sand Snake ladies, but also ensure that you have alternate characters that can help out in a clinch. I use x3 of The Dragon's Tail (PotS) for those spooky situations where I just can't seem to pull the right cards. Yes, I know it's also helping the other guy, so you have to do this in moderation. DON'T BE AFRAID TO MULLIGAN! This should be standard for most decks, but with this one I use it as a rule. If I don't get at least one of what I want in the first hand, I'm trying again. I use Valar simply because I will almost always have multiples of every card. It's also handy when you absolutely need to kill The Red Viper and nobody wants to do it for you. (I've had people avoid military attacks just for this reason, so you sometimes have to force the issue). You absolutely do not have to put every single Sand Snake on the board. I'm not gonna lie, it's super fun to do. But all it takes is one pull of Wildfire Assault (Core) and you just lost about everyone. Rains of Autumn (Core)...because if I can't have gold producing locations, neither can you. Valar Dohaeris (TWH) or Wildfire. It obviously won't protect against both but can at least stave off one. Burning on the Sand (RotO) simply because it's great. That's my jam. It's not going to conquer the world but it's pretty powerful when used correctly. And, as always, it's fun. Have you considered Desperate Measures (TCC) instead of The Dragon's Tail? It doesn't give you opponent a card. Plus anything good you discard can reenter your deck via Shores of the Summer Sea. If you dropped one copy of each unique snake (besides Obara) that would free up 5 card slots. 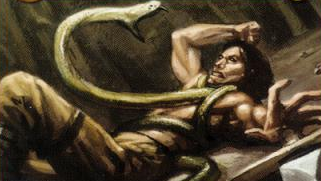 You could add A Nest of Vipers (TftH)x3 to accelerate your power grab and then Blood of the Viper (OSaS)x2 would give Kendry, Arrianne, Quentin, or Ellaria renown. To pull off No Use for Grief in the challenge phase, you're going to need to go second and/or some cancel protection. Consider a higher initiative plot than Loyalty Money Can Buy. Doran's Scheme (TGF) may be good as it would prevent your opponent from playing a cancel event on your No Use for Grief. Similarly, swapping Paper Shield (QoD) for The Prince's Wrath could let you cancel your opponents cancel. Overall, I like the deck. Thanks for sharing. I only recently added The Windblown and yeah...they're a tad underwhelming. In regards to lowering the number of Sand Snakes- that's been something I've been considering for a while. By the time my opponent starts hammering away at them, I've usually yanked in enough power to have gained the advantage. Good idea on Paper Shield as well. My only issue with Desperate Measures (TCC) is that you end up having to discard four cards each time. It's still something for me to keep in mind. I would absolutely second the recommendation to toss in A Nest of Vipers and Blood of the Viper to a lesser degree. ANoV is a fun way to grab 15+ power in a single turn. Obviously it's a perfect storm of card draw and it can't be relied upon, but when it happens it's a total blast. Forgotten Plans (KotStorm) won't help against Wildfire Assault (Core) nor Valar Morghulis (Core) as both events' effect occur in the plot phase. Any other suggestions? Perhaps play the The Art of Seduction (LotR) the round you're sure to pull of Viper+Grief, for at least one extra round with all your snakes. Ha, I encountered this just the other day. Art of Seduction definitely seems like an appropriate swap. Honestly, I've come to look at this deck more as something fun to toss out during our local game nights than something I'd ever consider for a tourney. Just too many chances for it to go wrong. Ok, I'm new to this. I know in the books, the Red Viper is a Sand Snake, but the card referenced doesn't show the Sand Snake trait. Am I missing card errata? If so, where can I find the card errata lists. Thanks (in advance)! I look forward to trying this deck out. For the purposes of this deck, No Use For Grief (DB) goes off when he dies, thereby allowing the Sand Snakes to come into play. He's the catalyst for setting off the Sand Snake trigger.